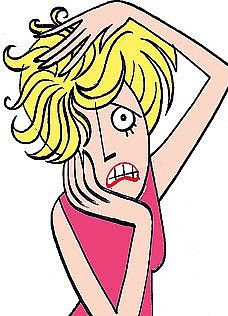 sight | I'm fine, but my Mommy has issues! Oli was recently given an amazing opportunity to work with another special needs child on a campaign by a company called Paper Clouds Apparel. 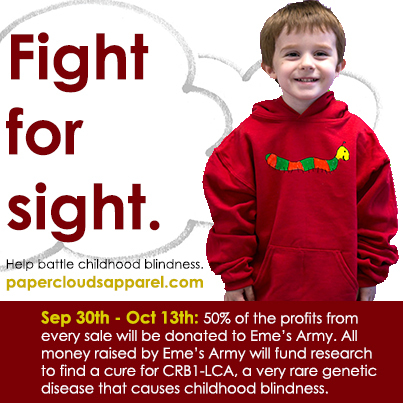 Paper Clouds sells t-shirts, hats, sweatshirts, hoodies, and totes featuring the artwork of special needs children. Oli has her handprint heart on two different t-shirts and a tote that is now available for purchase. She is featured alongside another child named Logan and together they have some incredible things to choose from. 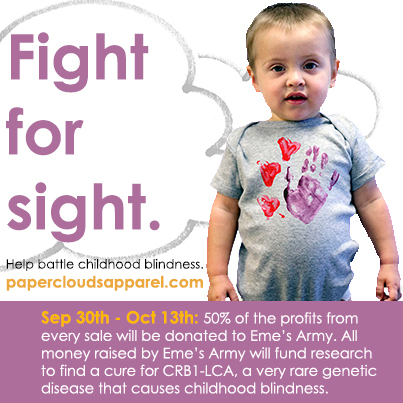 Paper Clouds Apparel employs special needs adults AND they donate 50% of the proceeds to a charity that we choose. We chose http://www.emesarmy.org. 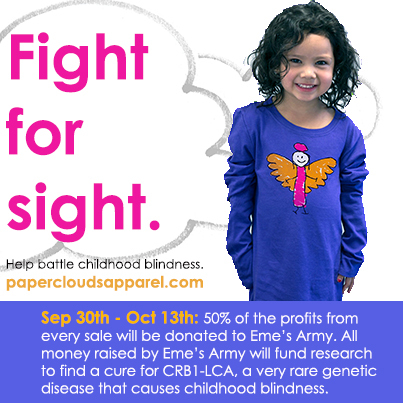 Emerie is a little girl who needs our help to get her eye sight back. 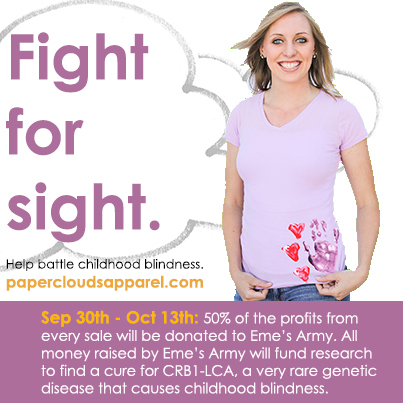 Please visit http://www.papercloudsapparel.com and check it out!! I can’t even begin to describe what this means for Emerie and her family. Imagine having a child go blind and then find out that there may be a way to treat it…it’s beyond incredible. I would do ANYTHING if there was a way for Oli to see. 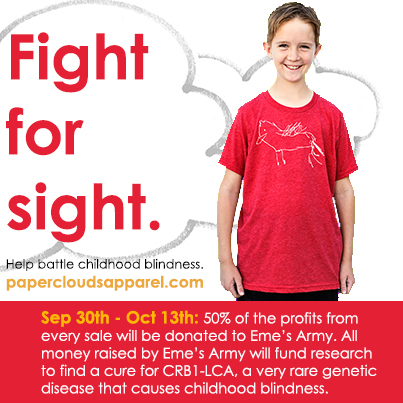 I may not be able to help Oli get her vision back, but I can help Emerie in a small way. What an opportunity. What a privilege it is. 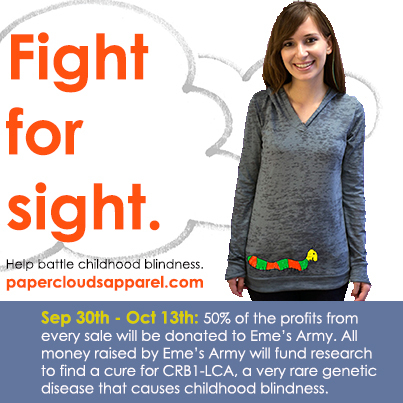 It’s a privilege not only to work with Eme’s Army, but also to work with a company like Paper Clouds Apparel. What they are doing for the special needs community is remarkable. They are making a difference in the world. 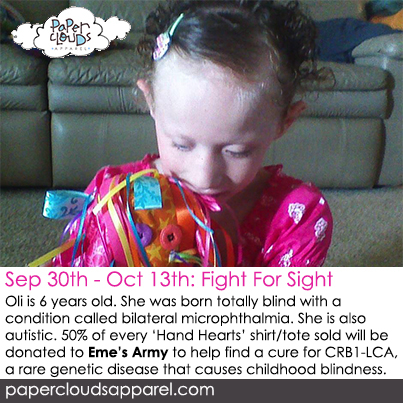 They are making it better and more accepting and more “normal” for kiddos like Oli. That’s something that I am extremely proud to be a part of. If you can, please visit their website or their facebook page. 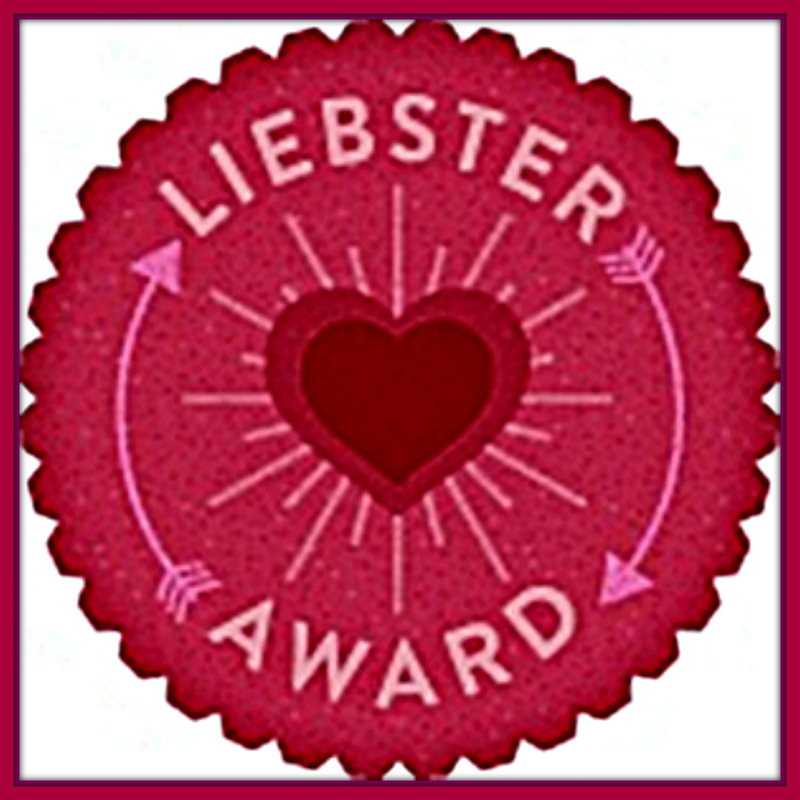 Share this campaign with your friends. Let them know that they can help too! I never ask you guys to share anything, but this is important. The more money we raise the better chance Eme has of seeing her family again. You don’t have to share it from here. 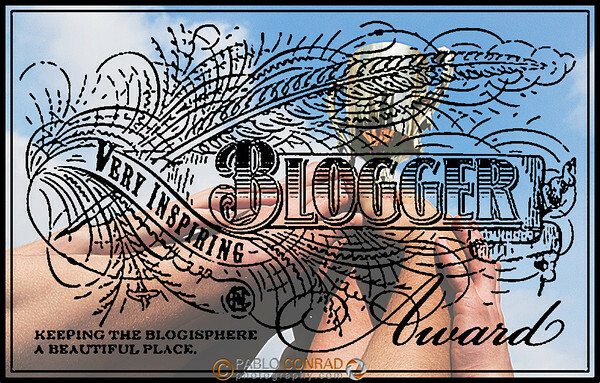 Share it from Paper Clouds Apparel. It doesn’t matter how, just tell people about it.